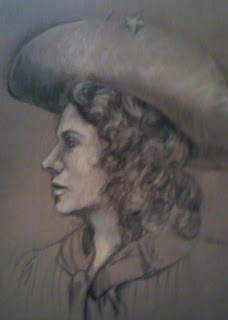 Riverview Art Studios: March MadnessFaces, Day 6: "Annie"
Pastell pencil on 11x14" Canson Paper. Legend and first female superstar, the epitome of self sufficient woman. Sharp shooter extraordinaire. This is day 6 of Indian River Studios and Gallery's March madness painting challenge.